This is the first municipal golf course to be built in Portugal and is located in the very heart of Lisbon, close to the airport. Its practice range remains open until 11 pm. Belavista is a short, although fairly difficult course, due to its reasonably undulating terrain, several bunkers and six artificial lakes (interconnected by a series of pipes and serving to collect rain water, which is then used for watering the course).The course has three par 3 holes, whilst the others are all par 4. Capable of satisfying the needs of both Taurus's and the naturally curious players. 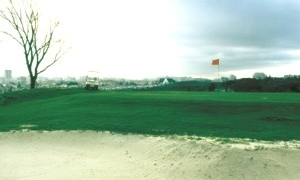 Due to its easy access and its location near the airport, the course may be played by visitors stopping over only briefly in Lisbon and not wanting to miss the golden opportunity for striking a few golf balls. Facilities: Driving Range, Putting Green, Trolleys, Caddies, Club Hire, Childrens Nursery, Pro-shop, Changing Rooms, Restaurant, Bar.